Gotham Bus, as an entity, seemed to have been loosely based on NYC Omnibus (which was an "affiliate" of FACCo due to both being owned by the same out-of-town firm up to 1954), and Mr. Marshall - wasn't he based, equally loosely, on longtime FACCo, NYCO, and later Surface Transit president John E. McCarthy? Interestingly, in closeups the cap Gleason wore as Ralph bore the name of another firm which I'm wondering about its history - La Follette Coach Lines. The scene then shifted to the driver's locker room (if memory serves me correctly), where the story began. I was just recalled a little skit from the old "JACKIE GLEASON SHOW"; Gleason (as RK) was in the driver's seat of a city bus mockup, and he's barking to the crowd boarding, "MOVE TO THE REAR!" Well, what happened was, the front of the bus reared up into the air! I still remember my Dad getting a big laugh out of it........man, where have the decades gotten to......?? We have often discussed here the "bias", if you will, towards FACCo. 's New Looks. It seems that in any detailed work (or discussion) on the Company, the New Looks are either totally ignored, or, at best, represented with one or two photos, at best. 1: If there are TWO photos published of FACCo. New Looks, surely, there must be a number of others. 2: When one reads of the Company's fleet from the earliest double-decker days to the end of the Company's reign, the New Looks are usually only briefly touched upon, or, worse yet, not mentioned at all. IMHO, the New Looks were an important part of the Company's rich history (think of transit historians ignoring the iconic double-deckers!) and should not, under any circumstances, be ignored. a) A shot of FACL and ST president John E. McCarthy with Mayor Robert F. Wagner standing next to a demo New Look in late 1959 (the company was a follower as opposed to a leader in this regard, compared with the "Tee-Yay" whose first New Looks [1-190] were already on the road within NYC when FACL's first New Looks [including the ten air-conditioned units] made their debuts). b) There are definitely some other shots of FACL and ST New Looks "out there" if you will. One of the ST units (on the Bx-31 - Southern Boulevard line) can be seen on Flickr, another was in a book by Guy E. Martin of buses that were delivered to the various NYC area transit entities between 1945 and 1975, and still another (3172) was featured in a movie where it was plying the M-106 - 42nd Street Crosstown at the time. As for FACL's allotment, there was also 3103, 3104 and 3105; 3123 (running of Rt. 5 - Fifth Ave./Riverside Drive on a snowy day), 3156 (on Rt. 16 - 34th St. Crosstown, thus indicating 54th Street depot origin) . . .
c) These were among the first buses to have front and side roll signs made by Transign (though by the time they were all consigned to the Kingsbridge depot in the Bronx within several years of the MaBSTOA takeover, such signs had all been replaced by "old-style" cloth signs). d) Together with the TA units, the FACL and ST buses were among the first in NYC to be built to 102" width after the ban on such widths was lifted; plus being among the first to have ad racks on the outsides of the buses after the ban on that was rescinded. These, I think, would belong in a book dealing with the Fifth Avenue Coach Lines (and Surface Transit) era of 1956-62. And that reminds me: Why has there never been a book out on New York City Omnibus that would have pics of the various models that entity ran? There was a New Look in the chapter of Surface Transportation / Surface Transit. What escapes me was what bus number that was, and on which Bronx route it was running when that photo was taken. As usual, a thorough "thesis" and a well-written post........great info! Personally, I would like to see a book dealing with FACCo. in its post-double decker years, focusing on equipment and operations from the the last double deckers to the first New Looks (and the end of the Company). Photos of FACCo. 's early single-deck buses are rare, compared to photos of the double-deckers. 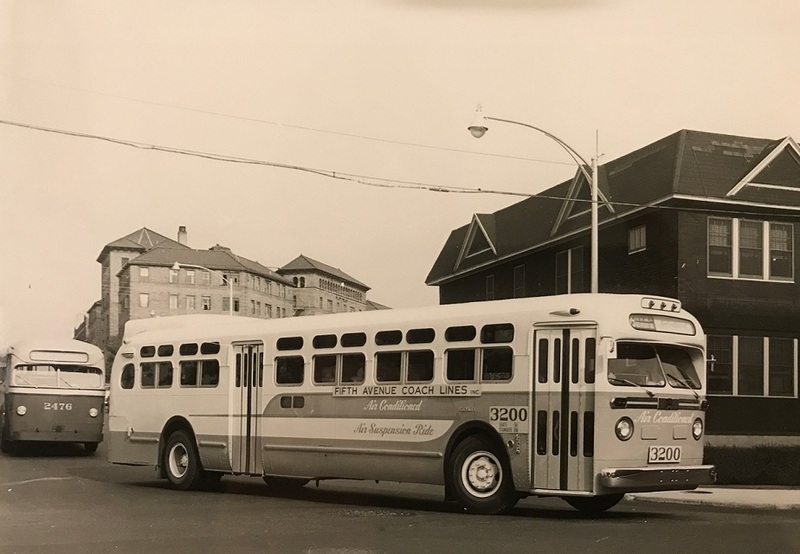 Here is an undated photo of #1030; note the side sign is set for Route #1 (YORK AVE.), while the front sign reads "SPECIAL". Though riding on the open upper deck must have been truly splendid on fine days, one cannot help but be practicle and wonder about inclement days. It would seem that only the hardiest souls would dare brave the elements "up top", on a raw, chilly, rainy/snowy day. This bus started out as a GM TDH-5103 with spring suspension. Rebuilt to be an air conditioned and air suspension demo and later it was still rebuilt with push out rear doors and finally sold to New Orleans Public Service. Here we see it in Queens as a demo for Fifth Avenue Coach and signed 15 Fifth Avenue-Queensboro Bridge. Faithfully followed by a Mack C-50 on the same route. Now, will someone PLEASE tell me where I can buy a "WAYBACK MACHINE"?? All kidding aside, THAT is what a BUS is SUPPOSED to look like!!! !